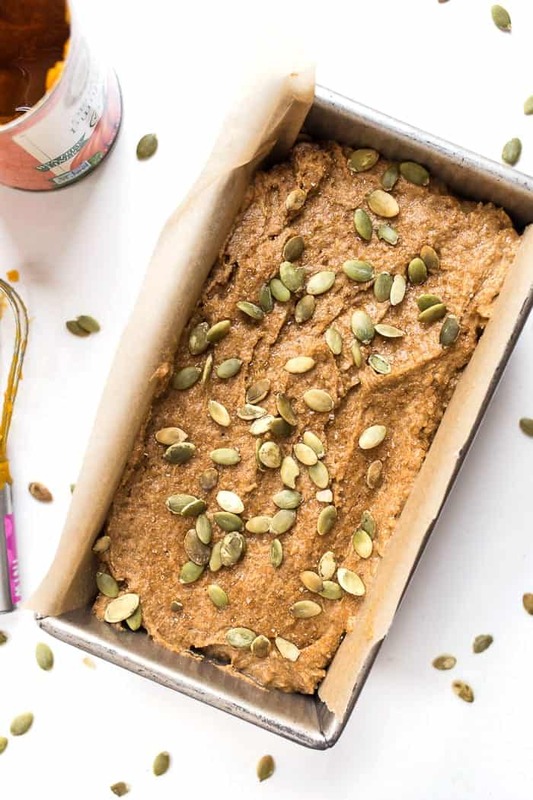 This healthy Gluten-Free + Vegan Pumpkin Bread recipe is packed with protein, fiber and healthy fats. It's also low in sugar and is the perfect breakfast! Happy Halloween! I can't believe we're already at the end of October, but seeing as this is a holiday to celebrate all things sweet and pumpkin, I figured it was the perfect time to give you this updated version of my vegan pumpkin bread! 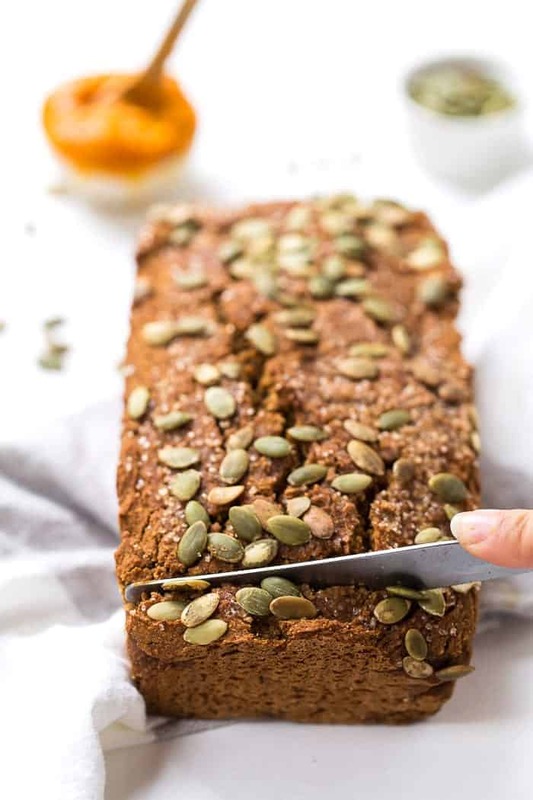 Plus, now that the weather has finally turned and the leaves are starting to fall, there's nothing better than toasting up a few slices of this incredible vegan pumpkin bread to start your day off right! Yes it's true…I've been forgoing my morning smoothie bowls, but I wouldn't have it any other way. There is just something so cozy and comforting about waking up and nourishing your body with a warm, hearty and protein-packed meal! I've been making almond flour based quick breads for a few years now, but I have struggled to veganize them. But since I know a lot of you don't eat eggs, either because you're plant-based or sensitive, I wanted to give you a vegan version of my favorite quick bread recipe to date. 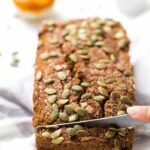 This healthy pumpkin bread is not only vegan, but it's also naturally gluten-free, packed with healthy fats, fiber and protein and uses just 6 tablespoons of added sweetener! 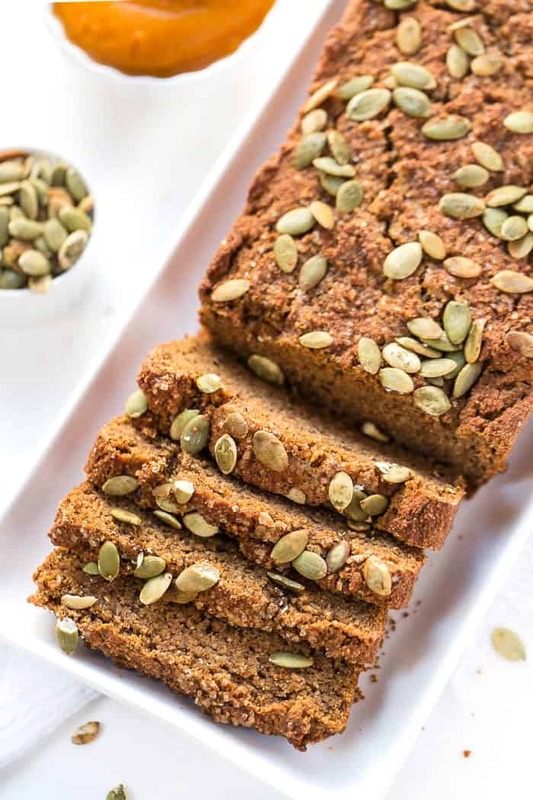 Unlike traditional pumpkin bread recipes, that call for over a cup of sugar and oil, this recipe is light and tender, without sacrificing on any flavor. 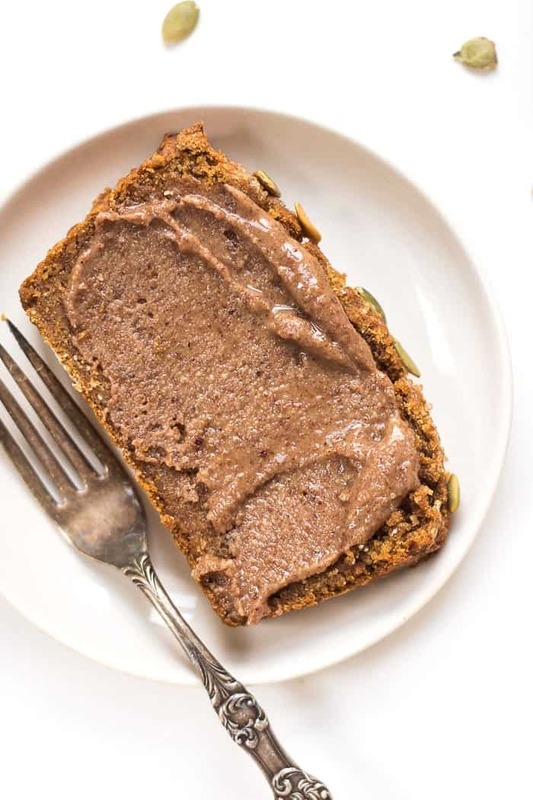 The trick is to use almond flour AND quinoa flour together as they're both naturally high in protein (helping to give the bread some lift), but also higher in healthy fats so they help keep it moist. And yet this recipe is still perfectly sweet, toasts up beautifully, has all those warming fall spices and tastes absolutely amazing! For serving, I'm always partial to slathering on some sort of nut butter! I particularly love my maple cinnamon mixed nut butter, but it's also amazing with some honey roasted peanut butter and apple slices on top. If you're not a nut butter fan, it's super tasty with some coconut yogurt or even just a non-dairy buttery spread. Honestly, you can't go wrong! If you're looking for even more vegan pumpkin recipes, you should definitely try my Skinny Pumpkin Quinoa Muffins, my Pumpkin Pie Quinoa Breakfast Cookies or my 90-second Pumpkin Pie Quinoa Breakfast Bowls! And if you end up making this recipe, I'd love to see ❤ make sure to share a photo with me on Instagram by tagging @simplyquinoa or #simplyquinoa! Preheat the oven to 350ºF. Line a loaf pan with parchment paper and set aside. Whisk together 2 tablespoons flaxseed meal with the water. Set aside to gel for at least 5 mins. Meanwhile, add the dry ingredients to the bowl and whisk to combine. To the bowl with the flaxseed eggs, stir in pumpkin, syrup, non-dairy milk, oil and vinegar and beat until smooth. Fold in chocolate chips if desired. Transfer batter to the prepared loaf tin, sprinkle with sugar and pumpkin seeds if using, and bake on the center rack for 50 - 60 minutes until the top has turned golden brown and a cake tester inserted into the center comes out clean. Cool in the pan for 1 hour then transfer to a wire rack and cool completely before slicing. I have been making your other vegan pumpkin quinoa and almond flour bread for quite some time but I cannot find it on your website any longer. I made a loaf last week and it is so delicious. Is it possible to get that recipe still, I didn’t print it out? Unfortunately, I cannot eat many of the ingredients in this current vegan bread but the other one was perfect. I didn’t see the nutrition for this, am I overlooking it? It should be in there now! This pumpkin bread is delicious!! We’re eating it entirely too fast 😉 I’ll make another one right away when this one is gone. Thanks, Alyssa! Hi Audra! I really think it was the oat flour vs. almond flour. They’re VERY different so I would expect a very different baking time! I like the sound of this recipe, but do not need it to be either gluten free or vegan. And I would like to have eggs in the pumpkin bread. That’s good protein too. So do you have a variation that is OK without the extra ingredients to make it gluten free and or vegan? I have almond Flour. Never heard of Blanched Almond Flour. Is regular Almond Flour ok? I can also make flour from Quinoa. Is that ok? Hi Alyssa! 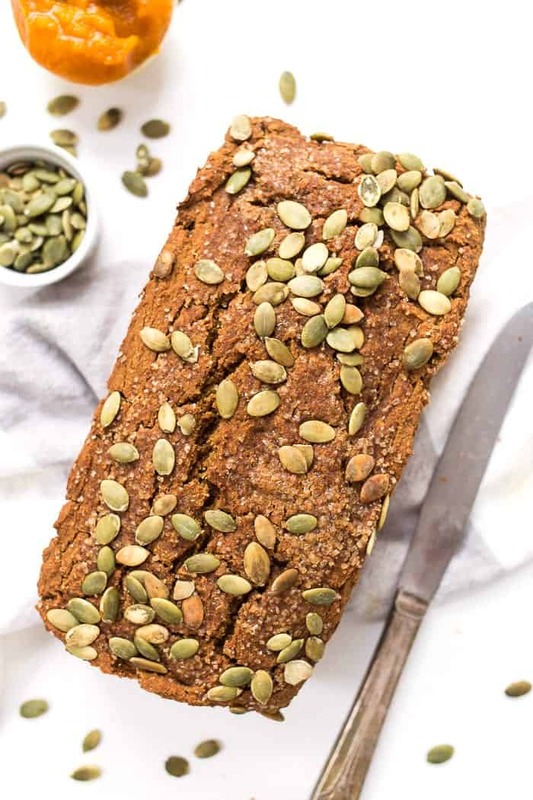 This pumpkin bread looks great! I only have almond flour, are all the other flours necessary or could I just sub them with almond flour? I haven’t tested it that way! I would say if you do, you might want to double the almond flour (or more) and use eggs instead of flax eggs. I really can’t be sure if it will work though – sorry! !